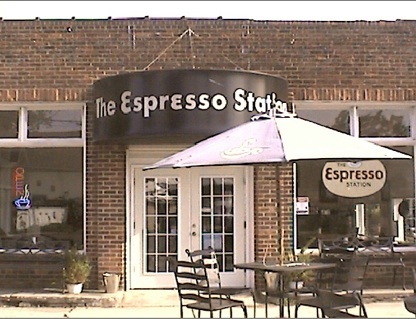 Espresso Station - now "Tattle Tale Cafe"
What used to be the "Esso Station" in the 1950's is the Espresso Station, the great coffee shop in Colonial Beach. Where folks once used to buy gasoline, you can now "fill-er-up" at this fun little cafe. Sitting on a wedge-shaped lot at Washington Avenue, this establishment has been serving up great java since February 5th, 2005. In addition to coffee, they offer Lattes, Mochas, Breves, Chai Tea and frozen drinks. They also carry pastries, specialty desserts, quiche and more. Here's a great black & white shot of the shop. 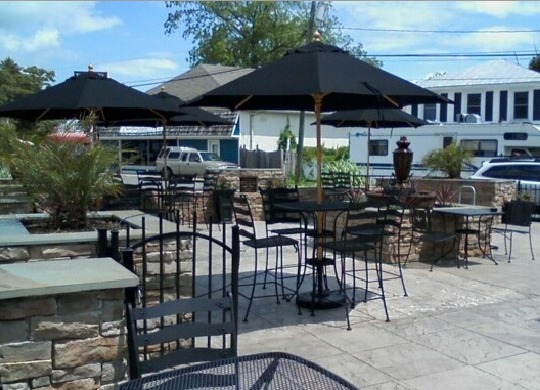 Come enjoy a refreshing beverage next to the fountain on Espresso Station's gorgeous outdoor patio area. 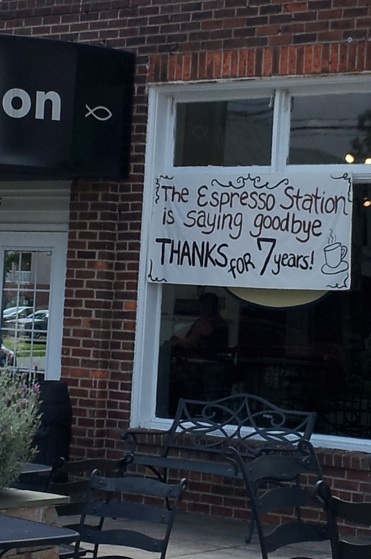 Owners Jeff & Julie Malecha bought the property with the intent to renovate the old Esso space, and lease out the additional space to other businesses. The shop opened in early 2005, and the Wide River Gallery and LaLa's Hair Salon occupy the adjoining spaces. Sadly, Jeff passed after an underground tank removal accident on March 23, 2010 at the front of the shop while making way for the new patio area. A candlelight vigil was held the next night and a collection fund setup so that the patio area renovations could be completed. The shop was understandably closed for awhile afterwards, with the town coming together to show their support for this wonderful family. They held a re-grand opening on May 21st, to everyone's delight. A memorial to Jeff can be found on the patio area.